Cha-cha Chai…a delicious hot beverage you can make at home! As she mentioned in her recipe…all ingredients; adjust to your taste! 1 teaspoon raw unpasteurized honey. This was a wonderful treat and sipping it by the fire was extra nice. Thank you Azita! If you try this drink, please drop me a comment. If you have a chai recipe you’d like to share…I’d love to hear from you! I baked an Upside-Down Apple Cake last night. Part of the directions was to boil water and then add the sliced apples, cloves, and cinnamon stick, turn it down and simmer for five minutes…then discard the cloves, cinnamon stick, and water. Well if you know me, you know I don’t like to waste, as well as I LOVE getting more than one “thing” out of something. 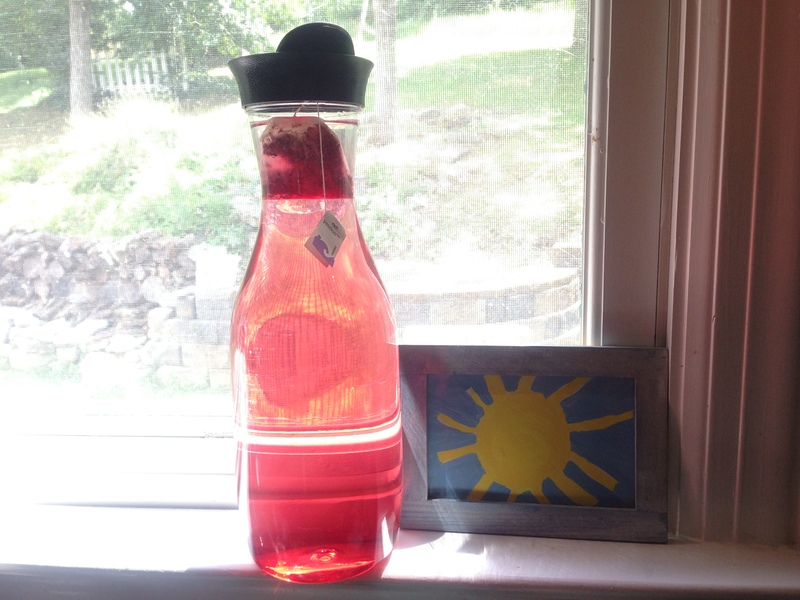 So instead of dumping out this amazing apple/clove/cinnamon infused water, I made tea! I remembered a tea that http://hariqhuang.wordpress.com/2013/08/02/apple-cinnamon-tea/ Hari made and it sparked my brain, “Brilliant I know what I can do with this apple spiced infused water”! Oh my! It was so good, that I am doing this every time I make this cake. In fact perfect compliment to it. When I was a kid and not feeling well, i’d add sliced ginger to this concoction. Ginger is very soothing for the tummy! Now even if you are not making this Upside-Down Apple Cake you can still make this infused tea. Peel, core, and slice two apples. I used granny smith. I like the tartness to them. Strain out the solids. Enjoy! Makes 4 nice mugs full of apple spiced tea! FYI: If you want you can grate the apple like (Hari) did. Or, you can slice the apple, then chop up the sliced apples, to expose more of the apple for a deeper infusion. I found just slicing them and simmering them for the 10 minutes did the trick. No real right or wrong. The flavors will depend on the types of apples used, but if you are an apple lover, then any type of apple will make for a nice tea. An herbal infusion is a tea that is steeped longer than a couple of minutes and usually more than one herb is used in a larger amount. By steeping it longer you get the maximum amount of essential nutrients from that particular herb/flower/etc. Herbal tea is really any “tea” that is non-caffeinated made from an infusion process using any herb, flower, or spice. True teas come from the tea bush (Camellia sinensis), which is where we get our green, black, oolong, etc. teas from). By the way…The upside -down apple cake was a hit. Family had it for dessert, then the next morning with half and half poured over top! This was a happy cake. We all couldn’t help smiling while eating it. An easy way to drink more water…Get a container, preferably a large one with a lid. (The one pictured is a 56 oz. bottle). Fill up the container with good clean water. (I say that because not all water is created equal!) I don’t always; but drop a tea bag in, any flavor; this one happens to be a passion tea by TAZO. And sip away. I will drink one to two of these bottles a day. And that doesn’t count the hot teas or a cup of coffee I may have throughout the day. That’s my version of flavored water. Simple and inexpensive! What do you do to help you drink more water? It’s a beautiful day. I’ve got the day, well this moment to myself. I’m going to sip this tea and breathe. If you haven’t tried chai, please do. Spice of star anise, cloves, cardamom, black pepper, cinnamon, and to round out all the spices; ginger. It really is a delicious blend. I like to add a bit more fresh ginger finely shaved and sometimes a splash of organic half and half. Clove: good for entire digestive tract and joint anti-inflammation. This little spice is jam-packed with nutrient dense goodness! It’s an excellent source of manganese. It has omega-3 fatty acids, vitamin K, dietary fiber, and vitamin C. Also a good source of calcium and magnesium. Cardamom: great digestion issues like IBS, heartburn, and intestinal spasms. When I’m feeling under the weather I consume this spice. Great for sore throat too. Black pepper: improves digestion in a very impressive way helping you get the most out of the foods you consume. It has antioxidant and antibacterial benefits too. Last but not least, a factoid; The outer layer of the peppercorn helps you slim down by stimulating the breakdown of fat cells! Woo hoo! Cinnamon: Reduce inflammation and has antioxidant benefits. Manganese, calcium, and fiber can be found in this fantastic spice. Smelling this spice can boost brain power! I do love the scent of this tea! Ginger: Aids in tummy distress! Anti-inflammatory and antioxidant benefits. If you are feeling nauseous ginger is the go-to. Potent anti-inflammatory compounds; it really is beneficial with arthritis and joint pain. I consume ginger daily in a drink I make and I can attest to the pain easing benefits. From the time I was a little girl, my mom would tell me to drink fresh ginger tea for any ailment I had. Look up more info on this amazing rhizome; the list goes on and on. Add fresh ginger shavings to everything! Black tea: High in antioxidant benefits; good for heart health. Great for memory retention.